MTT Tugs is designed to be medium-duty, utility tow tractor. With a 5,000 lbs drawbar pull (DBP), the MTT tug can tow or push anything from cargo up to medium-sized aircraft. The MTT tug offers the flexibility of a 15 mph top speed, and a tight 130-inch turning radius. The MTT aircraft tug is classified as a utility tractor because it also offers a 55 x 70 inch rear cargo deck that will support up to a 1,000 lbs payload. The MTT Electric Tow Tractor was designed to be a medium-duty, utility tow tractor. With a 5,000 lb. drawbar pull (DBP), the MTT Electric Tow Tractor can tow or push anything from cargo up to medium-sized aircraft. The MTT offers the flexibility of a 15 mph top speed, and a tight 130-inch turning radius. 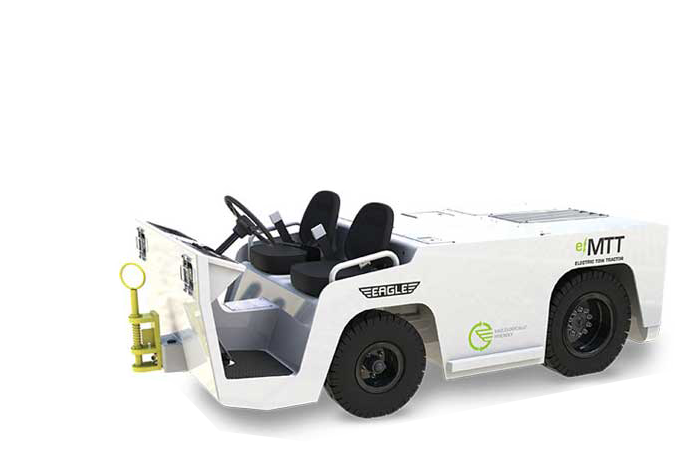 The MTT Electric Tow Tractor is classified as a utility tractor because it also offers a 55 x 70 inch rear cargo deck that will support up to a 1,000 lb. payload. Other features of the MTT Aircraft Tug include a rear sight tunnel for direct hitch visibility, an ergonomic operator compartment, and unmatched reliability and performance. The most flexibility comes from the MTT's environmentally-friendly 80V AC electric drive. When teamed with a "Smart Charge" battery and charger, the AC electric drivetrain provides the performance to meet the toughest of tasks. The MTT Electric Tow Tractor is a flexible, zero-emission solution for all of your towing needs. We also carry other highly-efficient Aircraft Tugs including XM Series Aircraft Tugs, USATS Aircraft Tugs, XL Series Aircraft Tugs, ETT Series Aircraft Tugs, and more. Get a quote today at Eagle Tugs! Load Type Ideal for aircraft or cargo up to 35,000 lbs. in all weather conditions.